I’ve added transcripts of Melrose parish names in the Roxburghshire Lieutenancy Book, recording local men whose names went into the ballot to serve in the militia between 1797 and 1802. There are hundreds of local names, for men aged 18-45. Occupations and addresses are included, giving a useful insight into the area then. For the transcripts, and a description of the original records, see here. I’ve had a hand-coded HTML site for my one-place study for some years, but it has become rather unwieldy in terms of structure and organisation, and it’s not the easiest thing for people to read. So I’ve now switched to a WordPress-based site, which will have a much more structured approach to the resources that I put online. I am also hoping it will encourage me to add more! The new site also incorporates the accompanying blog. All the previous blog entries have been imported, but their original in-text links may not all work. I will fix them over time. And new posts will be added to the blog here in future. Just put online slides from a talk I gave about 17th century Melrose some years ago. I’ve been spending much time in the last week in the 17th century, transcribing a lengthy poem about a corrupt court judge at Melrose in the 1680s. Doing that reminded me of the talk I gave in September 2013, at the conference of the Economic and Social History Society of Scotland, held in Inverness. I thought it would be nice if I put the PowerPoint slides from that online, so have done that – link here. It was a 20-minute talk, as is usual for academic conferences, so I was limited in how much I could say. But I covered a lot in the time allowed. Just blogged about references to smallpox in Roxburghshire records, and in particular in Melrose records. Both parish registers and memoirs of a childhood inoculation at Toftfield near Darnick, probably in the 1780s. 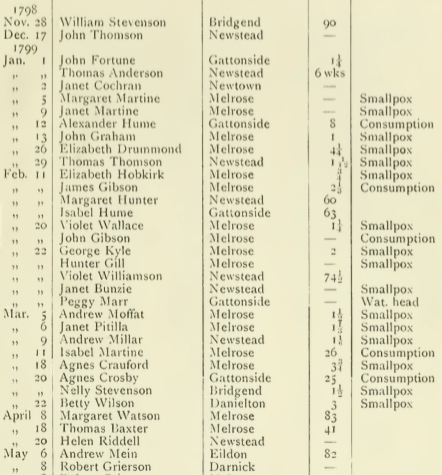 Reading a recent blog post by Emma Maxwell of Scottish Indexes re finding smallpox references in unusual places reminded me of some references to smallpox I’ve seen in my genealogical research. Firstly from my Melrose one-place study the Melrose parish registers include a burial register from 1781 onwards which includes causes of death, including many cases of smallpox. Names, addresses and ages at death are also given. The pre-1820 Melrose parish registers have been transcribed and indexed, and a PDF version of the resulting Scottish Record Society book is readily downloadable from archive.org. I intend to analyse these burial registers more fully soon as part of my one-place study, including analysing the causes of death as given. Although this one-place study focuses on the period with documentary evidence that can be studied and transcribed, especially before 1820, there is also an interest in the wider chronological history of Melrose and the surrounding area. And that includes extending far back in time before documentary evidence is available. One of the most famous sites in the Melrose area is the Roman fort of Trimontium, which was excavated in the early 20th century. There is now a permanent Trimontium museum in the town, and the Trimontium Trust promotes the site and its history. So I’m pleased to be able to say that the 1911 excavation report for Trimontium is available freely online. See here, in particular the link to the PDF page. PDFs of individual chapters are available, or a single 400+ page PDF of the whole book can be downloaded.